She united the Democratic Party’s competing wings to launch her historic campaign. Now she has to turn out a different kind of electorate. State Representative Stacey Abrams single-handedly united the clashing wings of the Democratic Party, at least for one night, behind her historic campaign to become Georgia’s first black and first female governor. There was former Ohio State Senator Nina Turner, a stalwart supporter of Bernie Sanders and Our Revolution, beside former Missouri Secretary of State Jason Kander, perceived as part of the Hillary Clinton wing of the party. They both came down to Atlanta to endorse Abrams at her campaign kickoff on Monday night at a middle school in the Kirkwood district where she lives. On the eve of a landmark congressional race in the adjacent sixth district—Kander had earlier canvassed with Democrat Jon Ossoff—the evening showed that win or lose, the special election is just part of a long and promising crusade to turn Georgia blue. “This is about citizens in this state feeling left behind, and Leader Abrams is making everyone feel included,” said Turner, who has emerged as a national political figure, to a small group of reporters before the kickoff. Kander agreed. “Leaders like Stacey are the ones saying yes. America is changing, but there is no reason to fear the future,” he said. Abrams is going to need both those wings behind her to win in 2018. She has already encountered unexpected turbulence in the race, with liberal, white Democrat Representative Stacey Evans, from suburban Cobb County, surprising many people by announcing she will also contend for the nomination. “I’m a little concerned that there’s a perception that [Abrams] simply can’t win, and it seems as though that’s related to her race,” Amy Nosek, cofounder of the local Indivisible chapter, told me Monday morning. Indivisible will stay on the sidelines of the race, as the fledgling group doesn’t endorse in primaries, but its passionate activists are expected to choose a candidate—and they don’t relish having to pick between a black woman and a white woman. “The language some use is there’s ‘discomfort’ about my candidacy, an ‘uneasiness,’” Abrams admits. But she is used to it. 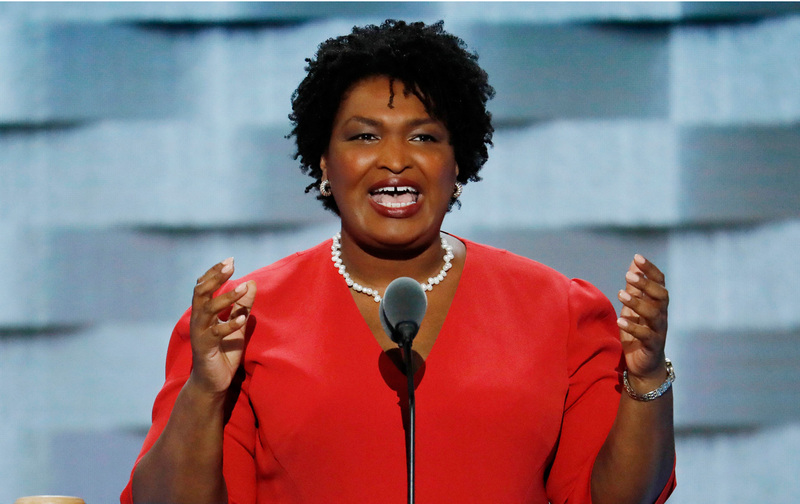 The founder of the New Georgia Project, established to do voter registration and outreach to the state’s growing population of color, Abrams has long argued that too many Democrats are using the same old playbook, pining for the white voters who began migrating to the GOP in the 1960s, when the two major parties essentially switched their stands on race. On stage, Abrams described growing up in poverty in Gulfport, Mississippi, and how her parents’ commitment to education led to her own decision to center education in her campaign, to develop “bold and ambitious children” in Georgia, “who thrive and not merely survive,” by expanding pre-kindergarten to 3-year-olds and guaranteeing that “everyone goes to the 13th and 14th grades” through free technical college. “We are currently educating our kids for low-wage jobs,” she said. Abrams then pledged, “I’m coming for you, Georgia,” she promised. The multiracial crowd surged forward to surround her, and she stayed in the middle school gym until she shook every hand.